No reviews? Really? I'll make a short one then. It's Pokemon! Yeah the previous seasons were.. meh but this set Pokemon on the right path, the episodes all have a decent plot and Ash actually shows he has some experience under his belt for the first time in awhile. And Pikachu is still pretty good for a pokemon that jumps from level 5 to 80 then back to 5 at the start of every season. This re-kindled my love for Pokemon :3 Very nice watch! 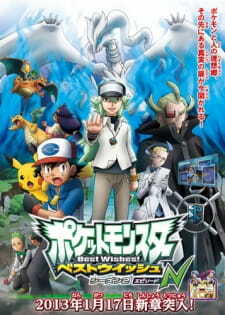 In this pokemon season the story focuses on N and the legendary pokemon of Unova. Well if you followed the game Black And White after that Black 2 White 2 you will see well from my point of view the anime didnt live upto the game or the game sequals. I wont say the main game character [Black/White or Black 2/White2] was absent and thats why the anime didnt turn out to be a better season but still it felt like they tried to rush in and missed N's true ambition and other stuff that we seen in the Black and White game. Also they tried to focus what we seen in the game black 2 white 2 like Ghetis's plan after 2 years and the outfits of the team plasma. Also Including the scientist all of a sudden. The anime should have atleast follow the time line from the pokemon game and try to make it that way but sadly they tried to keep balance between and black white and black 2 white 2. Also Cheren's appearance was questionable too. But still it was enjoyable by seeing same old Ash pikachiu and their ideals. In the end i should say rather than rushing to the scenarios of black 2 white 2 they should follow the scenarios of Black And White it would be "More Enjoyable". Honestly, I wouldn't have been disappointed for this season to be the end. But *deep breath* there's just one more season before I'm finally out of Unova... I can't imagine what the storyline is going to be for the next 20 episodes, but I can't imagine it will top this. I guess that just leaves me hoping the next 20 episodes won't leave me feeling like they were a big waste of time. Let's do this.